Prom Hairstyles For Long Hairs is the second toughest decision to make after the right dress. Your prom night is a night that comes once and stays in your memory forever. This means you need the right dress, the right makeup, the right jewelry, the right footwear, the right perfume and the perfect hairdo. Softly teased hair: Part hair and push the bangs to one side. Lift a section of the hair and run your comb from the tip of hair to scalp. This will cause the hair to clump. Simply smooth the top portion of the hair. Continue in this fashion till all hair is done. Then sweep the hair back behind your ear at the nape of your neck on one side and pin it. Then sweep the other side and roll on tip of your head. Secure with pins and spray with hairspray. Comb and set the bangs. Luxurious waves: Curl your hair from the middle length which means the top portion of your hair is relatively flat. Let the curls set for a few minutes before brushing it out. Simply comb out the top portion of air and put pins (the same color as your hair) on each side behind the ear. Sleek twisted hairdo: Wash, dry and detangle your hair. Divide into two parts and tie them into ponytails on each side of your head. Twist the hair starting at the top of the ponytail and as you reach the base of your neck turn the hair in a tight manner to make it coil and secure it with pins. Do the other side. You can use spray to add additional luster. Soft curls: Wash and apply a product on the hair to add texture. Pull your hair to one side of your shoulder and pin it at the back. Slowly twist sections of your hair to create soft waves and curls. Crimped hair: Wet your hair slightly and use the crimper on most of your hair except for the front. You need to crimp as close to your scalp as possible. Use the uncrimped hair to pin and hold back the crimped hair. 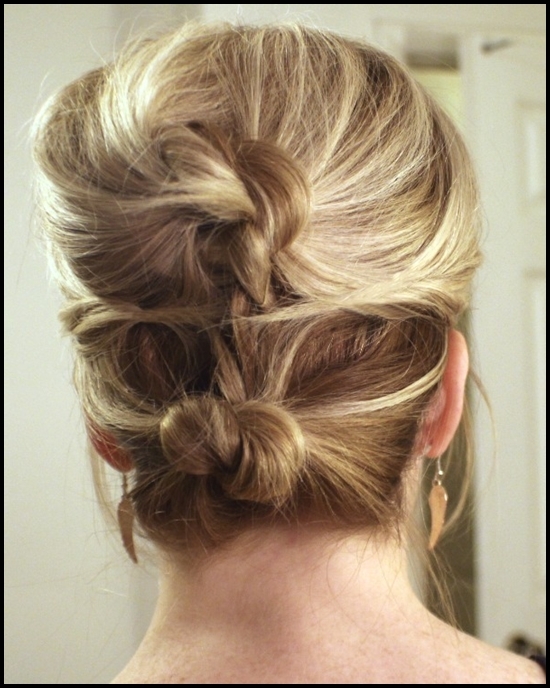 Chic Chignon: Plait a portion of your hair towards the back of your head and secure it with a elastic band. Sweep all your hair along with the plait and twist the hair into a bun on the side of your hand. Secure it with pins and then spray it. Decorate with a few decorative pins. 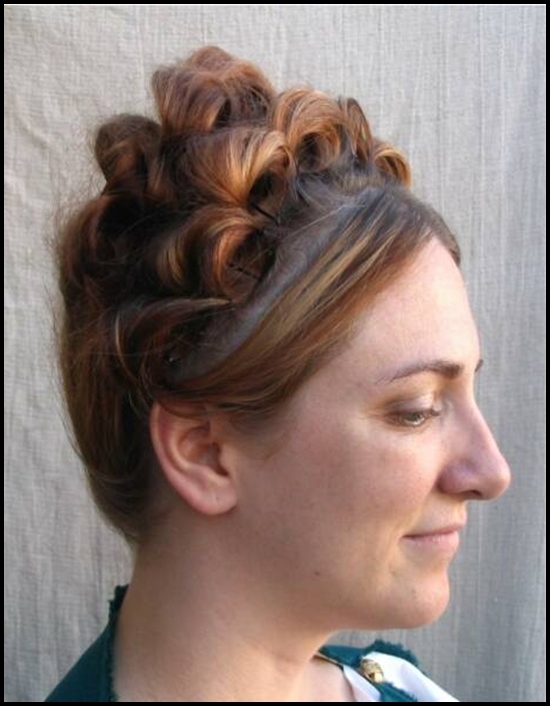 Updo with two knots: Brush your hair and divide into two portions. Make two ponytails one slightly higher than the other. Roll each into buns loosely and secure with a pin. You can add a flower to make it look more romantic. Posh Pouf: Back comb the top half of your hair and pin it to create a pouf on top. Make a ponytail with the rest of your hair with an elastic band but do not pull your hair all the way through. Spread the hair into a wider fan and tuck the ends to the back of your head with pins. Spray to keep the do in place.